The project WE33ν is the continuity of WE33(EMEIS33), which was presented by Artia Gallery at the Platform Project@Art-Athina 2013 by Artemis Potamianou. The main ideological idea of the team is enabling the “I” in “WE”. It is the condition where members of the team cooperate and work together constantly powered by the relationship between them and the interaction with the surrounding environment. 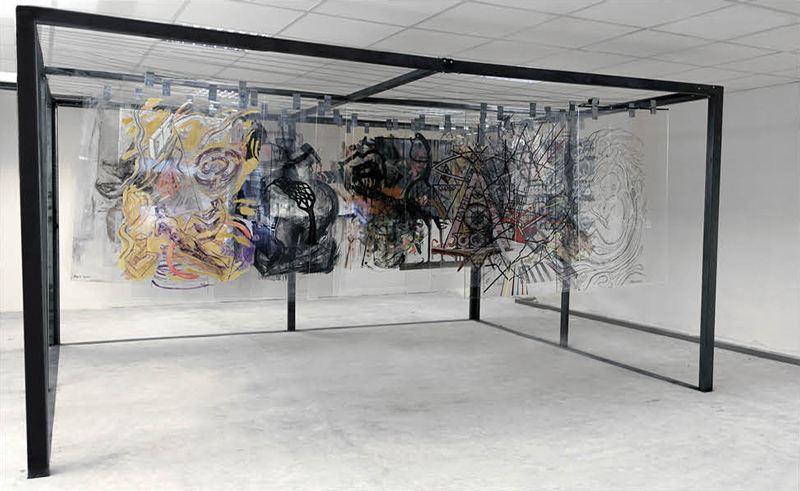 WE33ν the construction could be described as a synthesis, an exploded view of size 3x4x2.10 m. which consists of 33 pieces of painting made of plexiglass. Through the material, the clear intension for coexistence and communication is highlighted. While the individuality of each painting remains explicit and conspicuous, it is merged through transparency, so as to operate creatively in space. The artwork is interactive, as it is possible for the visitor to change the position of each painting. Therefore, they create infinite compositions - various combinations of communication.